The 2017 edition of the Human Proteome Organization (HUPO) World Congress came to a successful conclusion this fall, with more than 1,300 delegates from around the world sharing their latest research and technology advancements in Dublin. 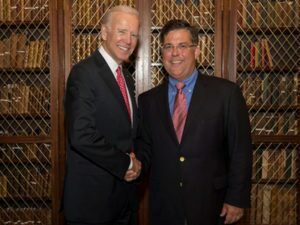 As a proud supporter of the meeting and a member of the HUPO industry advisory board, the Waters team was honored to sponsor a special gala dinner featuring a keynote talk by former U.S. Vice President Joe Biden to key stakeholders in proteomics research. Former VP Joe Biden with Roy Martin of Waters at HUPO World Congress. Vice President Biden gave a passionate address, reminding us of “the urgency of now” and impressing upon the scientific community how what’s happening in cancer research is already affecting many, many lives. He described the challenges and successes he’s experienced both in government and now with the Biden Cancer Initiative to remove obstacles to progress – including improving data access and providing more computational resources. Mr. Biden is noted for his efforts in promoting cooperation between public and private entities and between government agencies and scientists; similar (but much larger) to many of our efforts at Waters to enable our customers. Providing comprehensive, accurate data to the proteomic and now the proteogenomic community drives developments at Waters. We are proud to be a sponsor of HUPO and of the greater effort to understand and fight cancer. Also at HUPO World Congress this year, Waters showcased recent work done using SONAR, the data-independent MS acquisition mode that collects quantitative MS/MS data on the Xevo G2-XS QTof mass spectrometer, as well as a new version of Progenesis QI Software for Proteomics (QI.P). As part of our program to allow third-party software solutions better access to our raw data, we showcased SONAR’s compatibility with both Biognosys’ Spectronaut Pulsar as well as a version of OpenSWATH. Hannes Rost, the software developer behind OpenSWATH, presented a talk in HUPO’s new technologies session demonstrating SONAR’s superior performance over a typical SWATH data set. Waters also made a joint announcement with Biognosys during the meeting that we are now co-marketing a proteomics workflow that combines SONAR, Progenesis QI.P, and Spectronaut Pulsar. The improved data quality of SONAR allows for a truly qual/quan data file that is perfectly compatible with multiple data analysis solutions. Adding Biognosys’ Spectronaut Pulsar opens up new ways to analyze the same SONAR raw data file.